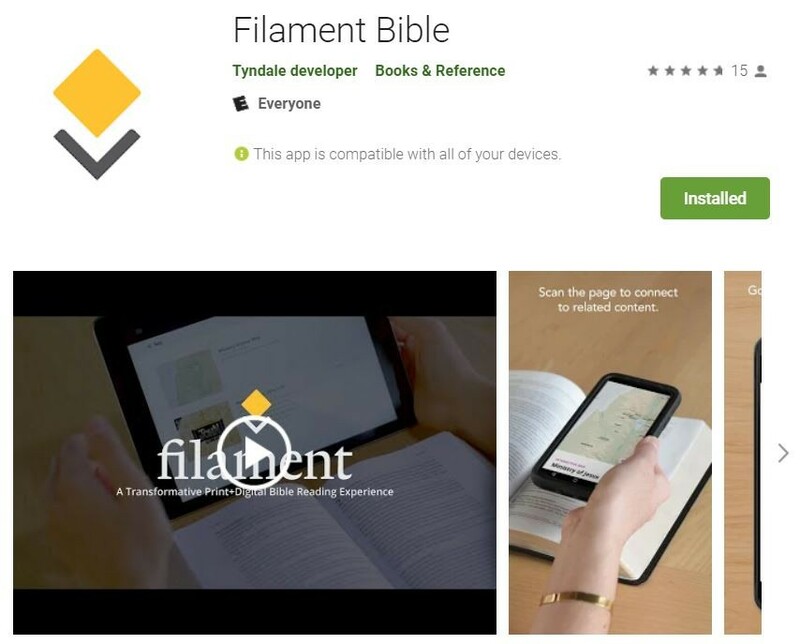 Tyndale’s Filament Bible is a combination of a printed text NLT and an app. 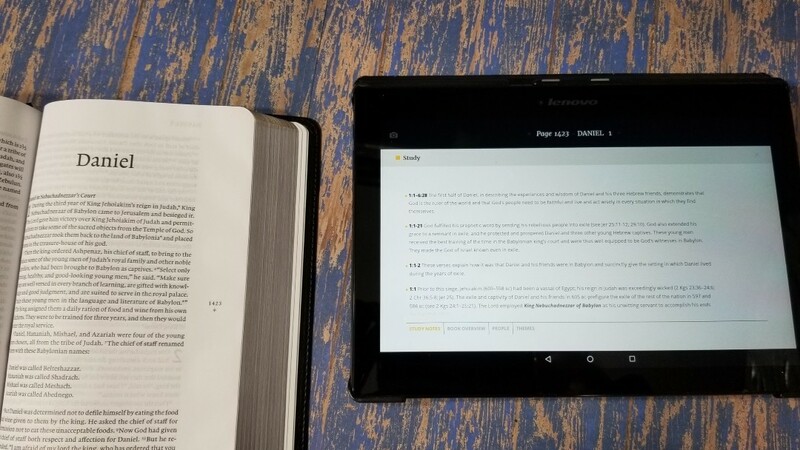 They can be used to create a study Bible that’s filled with interactive information while remaining easy to carry and use. 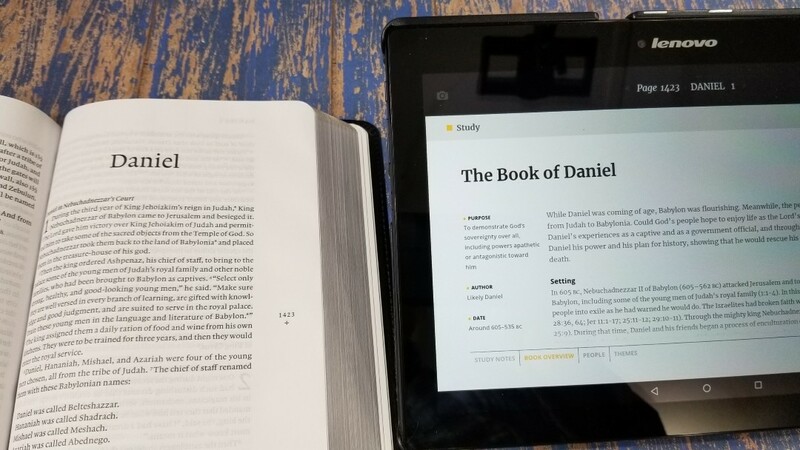 The Bible is clean and works perfectly as a reading and carry Bible, but you still have access to study notes, maps, videos, and devotionals. 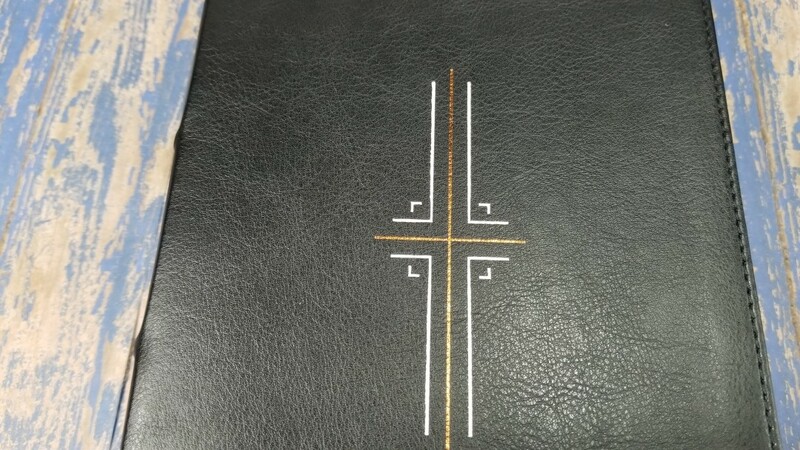 It’s available in imitation leather and hardcover. I’m reviewing both editions, They’re printed in the USA. 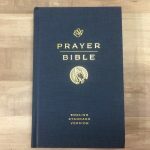 Tyndale House Publishers provided this Bible in exchange for an honest review. I was not required to give a positive review – only an honest review. My opinions are my own. Most of the following are affiliate links. 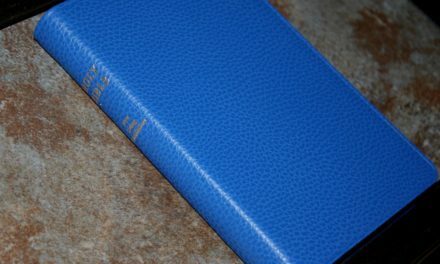 Filament is available in imitation leather and in hardcover. 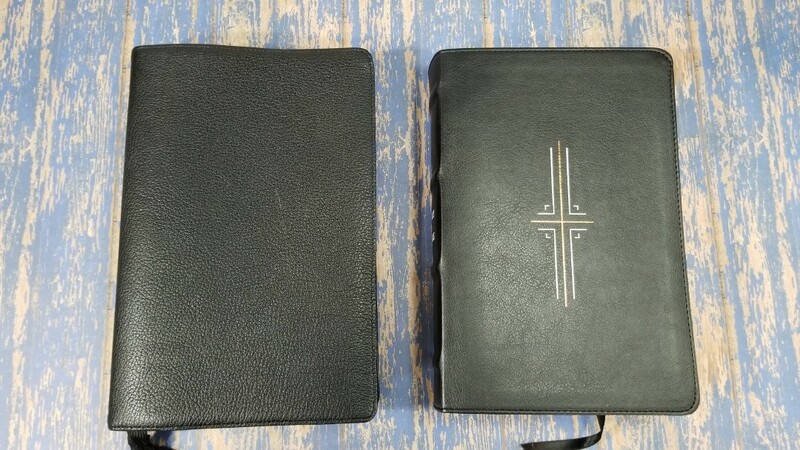 Both editions are sewn. My copies have a little bit of cockling (creases in the gutter). The book-block is 5.25 x 8.25 x 1.5. This size is easy to hold and carry. Both editions come in nice two-piece boxes. 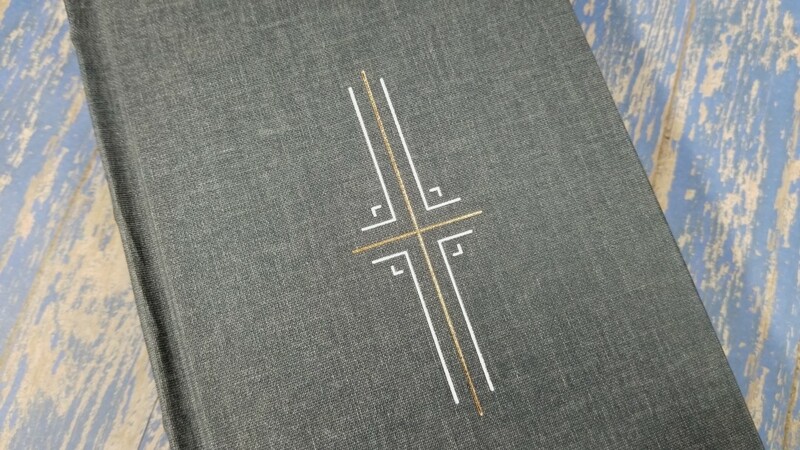 The imitation cover has a nice grain and texture. It has perimeter stitching and a vinyl paste-down liner. The front has the Filament logo printed in white and copper. 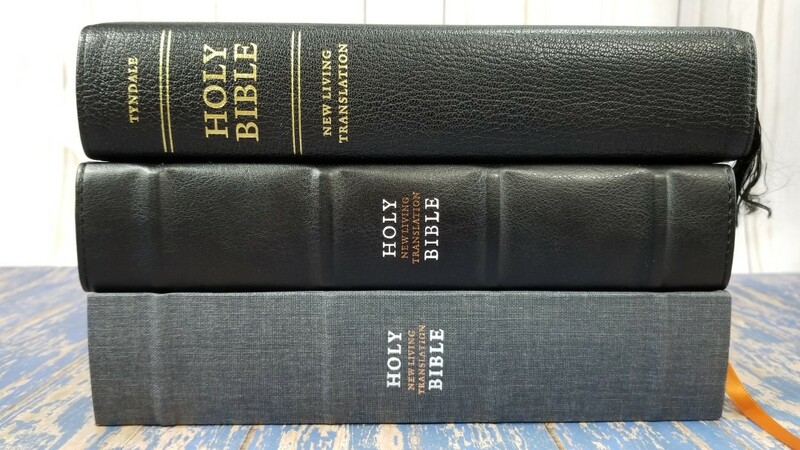 The spine has HOLY BIBLE printed in white and New Living Translation printed in copper between them. It has four raised ribs. It includes a black ribbon. It’s stiff, but it should lay open after it breaks in. The cover is 5.75 x 8.6 x 1.6. It weighs 2lbs, 4.6 oz. 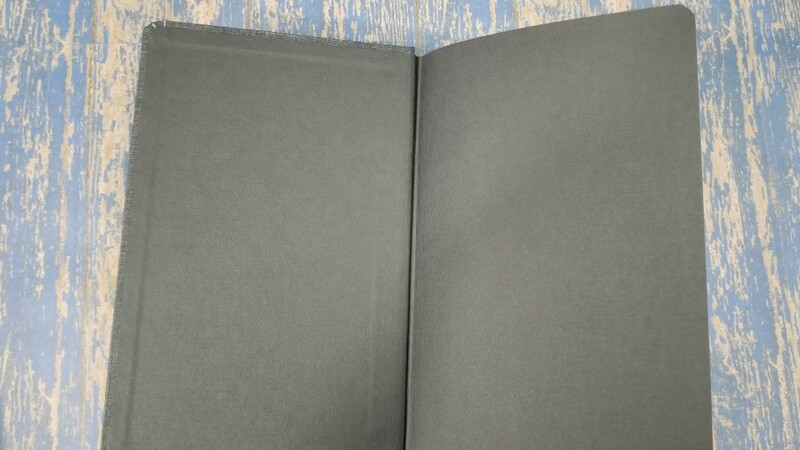 The hardcover is dark gray cloth over board. 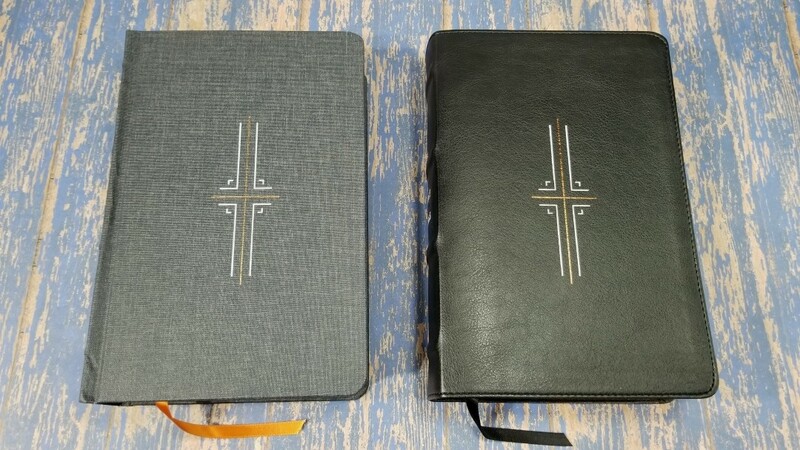 It includes the same logo as the imitation leather edition on the front and the spine, and it also includes four spine ribs. 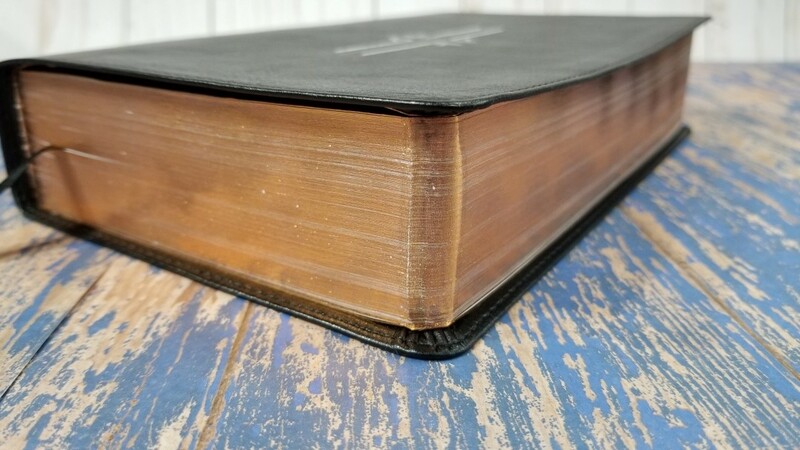 The cover is thick and feels rugged. I love the design. I like both covers, but I think I like this one the best of the two. It has a copper ribbon. The cover is 5.5 x 8.5 x 1.75. It weighs 2lbs, 8.2 oz. The paper is around 28-30 gsm. It’s white in color and has good opacity. It has a good texture that’s easy to grab and turn. The paper is a touch noisy as you turn pages. I could see a slight bit of glare under direct light. It’s barely noticeable, but I thought I should mention it. I think this is good paper for reading and marking. The edges for the imitation leather edition is gilt with gold with a copper color that seems like different colors depending on the light. 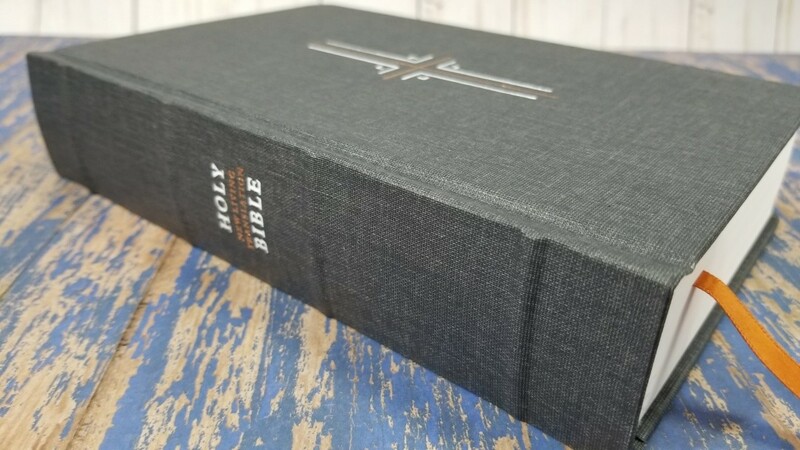 It’s white when the Bible is opened. I find it eye-catching. I like it. 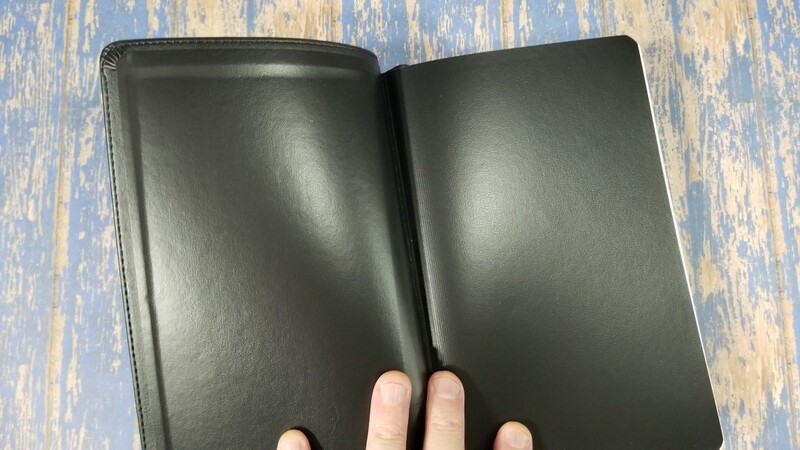 The edges for the hardcover are white. The pages have rounded edges, so they do have a finished feel. This is a single-column layout in paragraph format. 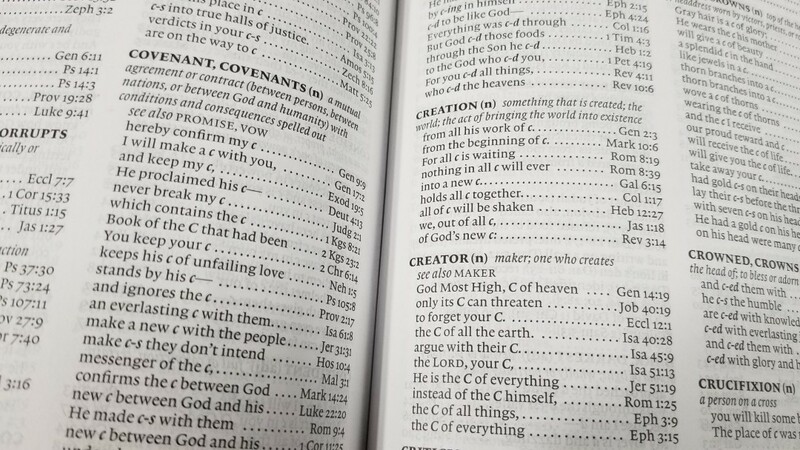 Poetry is set to stanzas (including the NT), letters are indented, and it identifies OT quotes. The header shows the book name and chapter number. Page numbers are printed in the outer margin. Footnotes are placed in the footer. 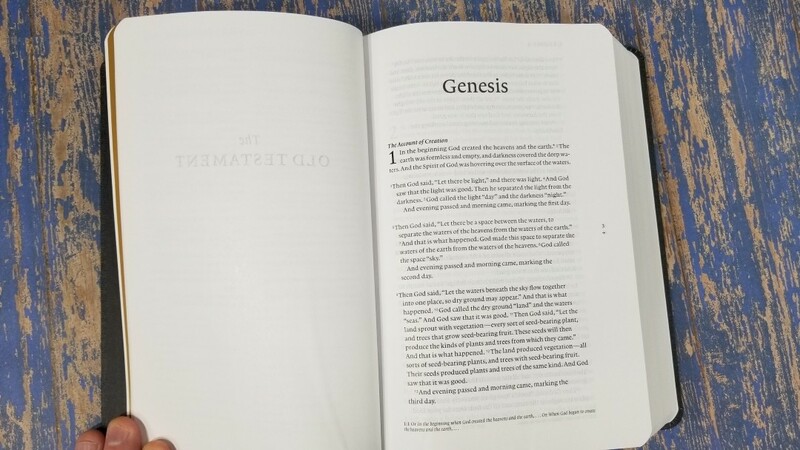 Aside from the location of the page numbers and it not having references, the text has the same pagination as the Tyndale Select. The font is 8.75 Lexicon. It has a generous leading. It’s black letter and it’s nice and dark without being too bold. I find it easy to read. The print quality is sharp and consistent throughout. The text never feels crowded. It has around 71 characters across with an average of 12-14 words per line. It’s printed with line-matching to improve readability. The outer margin is just a touch over 1″. You can use this space for notes as long as you don’t write over the page number and + symbol. 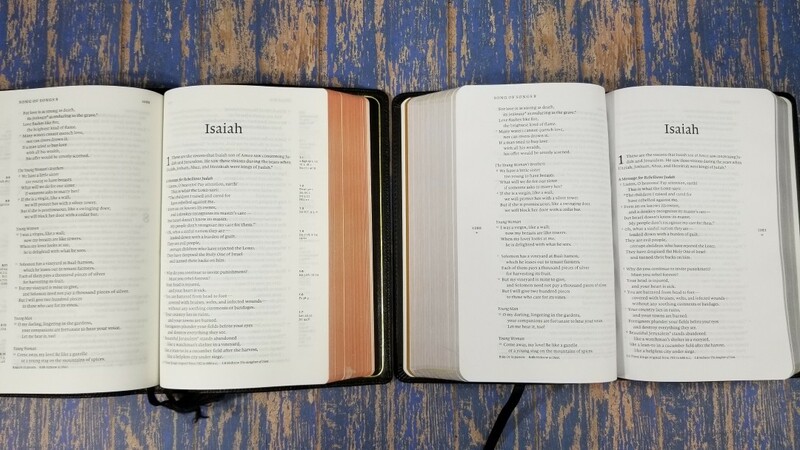 Verse numbers are small. They can sometimes be a little difficult to find, but it’s great for reading. Section headings are in bold italics. They stand out enough to be helpful. I find them easy to use when I want them and easy to ignore when I don’t. Footnotes are marked with an asterisk within the text. If a reference has an asterisk then it shows where something is quoted from. Poetry is beautiful. The columns are wide enough that they’re able to break the poetic lines where it makes the most sense. 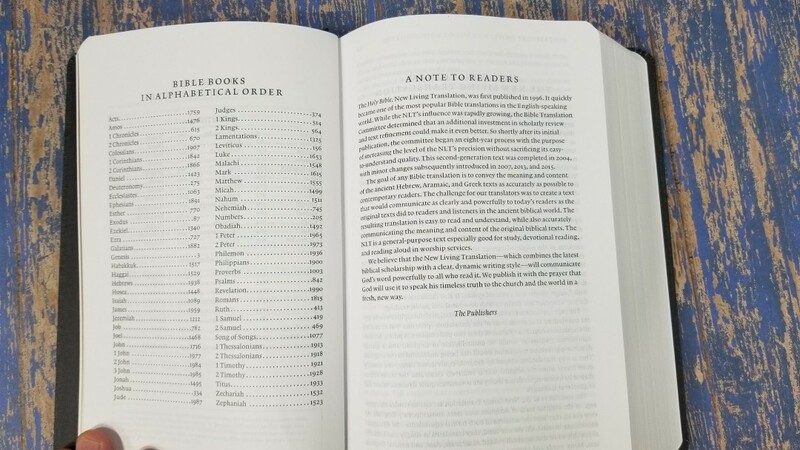 Footnotes appear in the footer of the page and have the chapter and verse number that they correspond to. 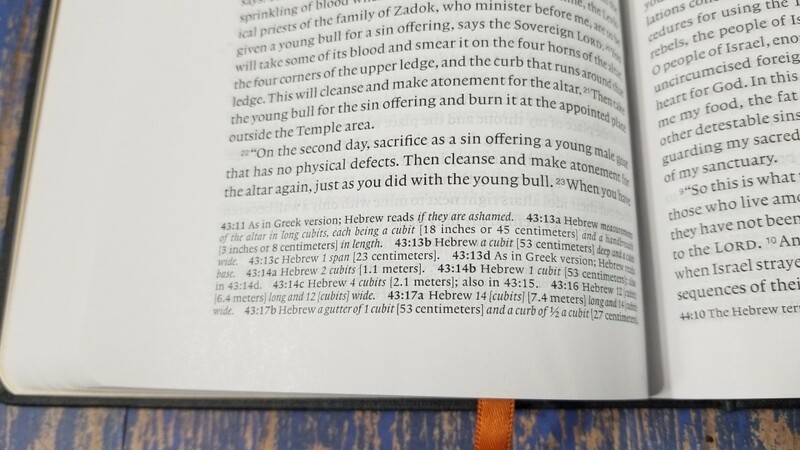 Textual footnotes show literal renderings, marking them as Hebrew, Aramaic, or Greek. 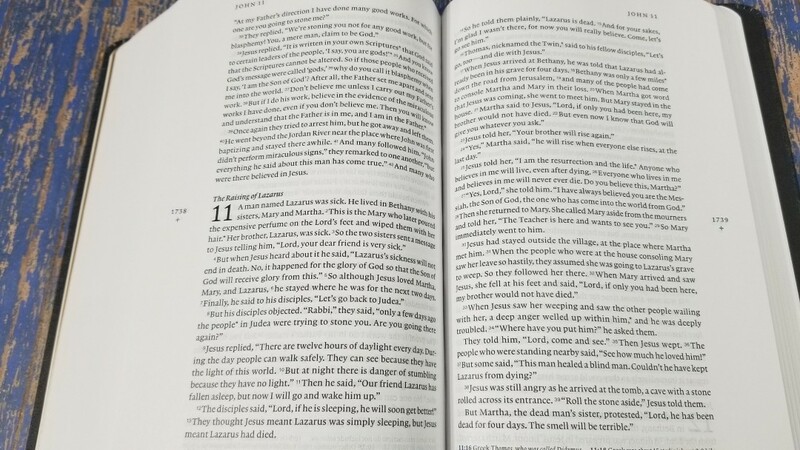 They also show alternate renderings, manuscript variants, where something was quoted from, if a quote is from a Greek version of the OT (it includes the Greek version), cultural and historical information (such as places, things, and people), the meaning of names when it’s relevant to the meaning of the text (for example, if it’s used as word-play), and weights and measures. It has a 119-page concordance/dictionary combo. It provides the part of speech with a short definition. 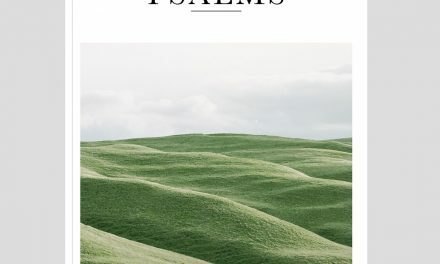 This is an excellent concordance for research, study, and sermon or class prep. 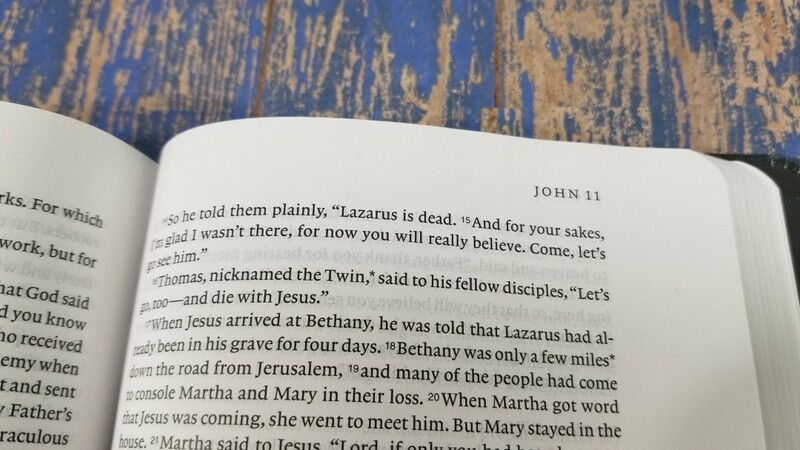 The Filament Bible uses the same pagination as the Tyndale Select. Here’s how to look next to each other. The Filament app is a free download in the Android and iOS stores. 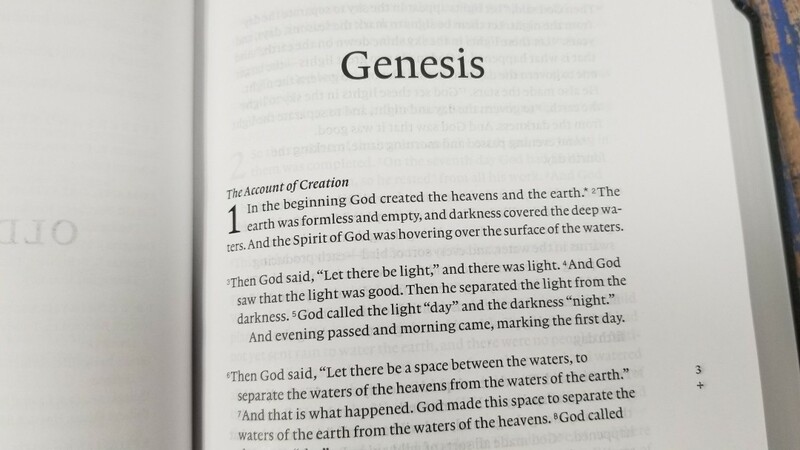 The app works both on and offline and requires a camera to scan the + and page number in the outer margin of the page. It displays everything in portrait mode with the exception of videos, which can display in portrait or landscape. The main menu has all of the navigation features for the app. At the top is a camera button. This changes to the camera screen with the scanner. Under this is a section that shows the book that you scanned. 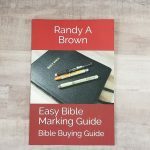 It includes the page number, book name, and chapter number that you scanned. Under this is the three tabs that include Study, Reflect, and See. At the bottom of the screen is a question mark that gives you a quick walkthrough of using the app. You can click on any of the tabs or information for more notes. Click the X to go back to the main menu, where you can click the three sections or the camera icon to scan another page. You can click the page numbers to see the notes for a different page or click the book name to choose a book and chapter. The Study window provides the study notes that relate to the page. It includes tabs so you can see other information such as book overviews, profiles, and articles. Tabs include Study Notes, Book Overview, People, and Themes. 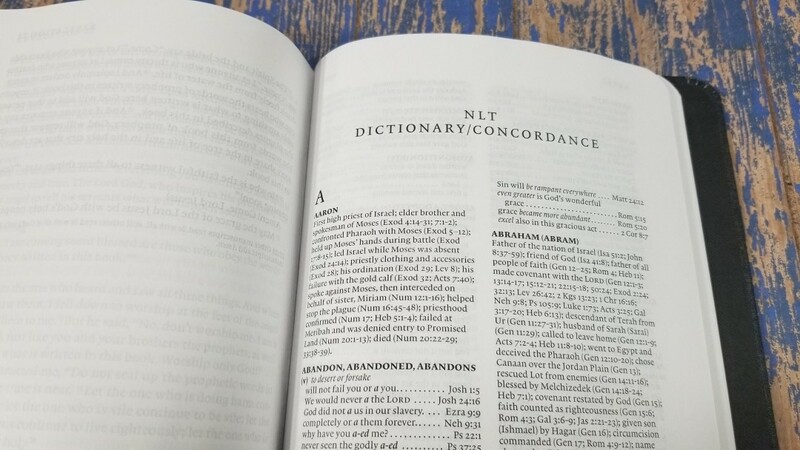 The study notes were adapted from the NLT Study Bible. One advantage is the notes can link to multiple places in the text. This means you can have the same information or profile appear in more than one place using the same note. 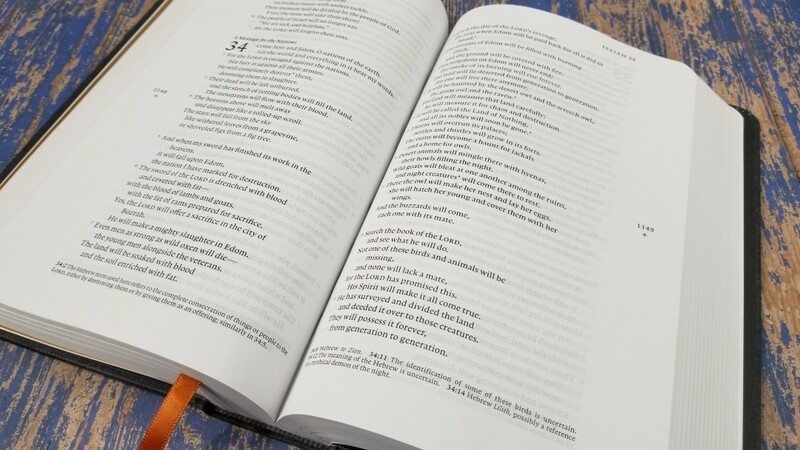 The Reflect window provides devotionals that are related to the content on the page. 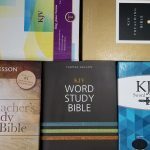 These are great for daily devotions. 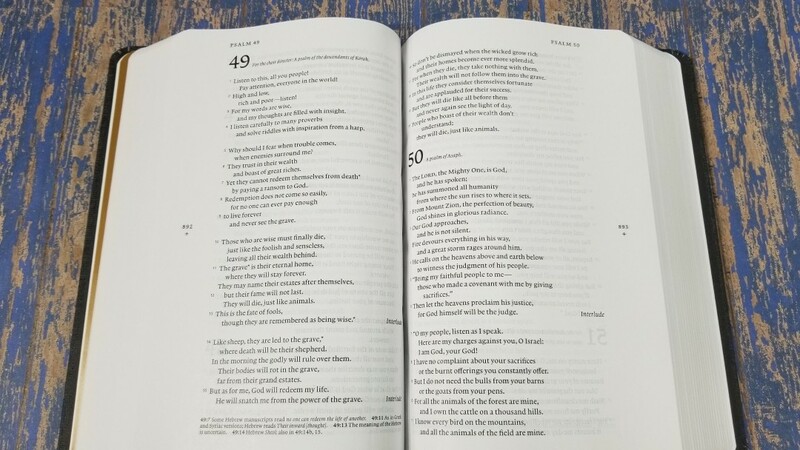 The Reflect content are devotionals from several Tyndale books. It includes the author and book name for each one (for those that are currently printed in other books). The See window requires an Internet connection. Their loading speed will be affected by your connection speed. It shows all of the visuals such as videos, maps, and illustrations. The maps are interactive. The maps and illustrations were made specifically for the Filament app. The artwork is from the NLT Study Bible. The videos are from The Bible Project. 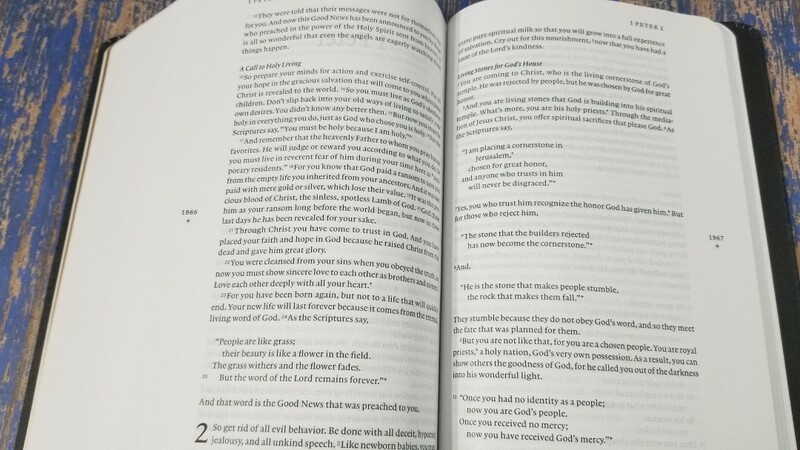 The Filament Bible is excellent for reading and carry. 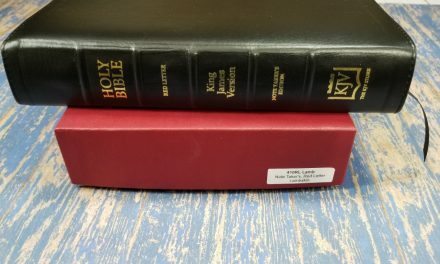 I was already a fan of the Tyndale Select that this Bible is based on. Since this one removes the references, the page is even cleaner and more inviting. You can write in the margins if you want (as long as you don’t cover the page number and + symbol). The Filament app is fast and intuitive. The download is about 95 MB and contains everything except the videos. It does require a decent connection for the videos, but if you can run YouTube you shouldn’t have any problems running these videos. Navigating around the app is simple. Everything is labeled well and it has a short tour to step you through it. The camera isn’t compatible with some older devices. I had trouble with my Lenovo Tab 2 A10 (it had landscape and portrait swapped and the image through the camera was extremely dark), but all other devices worked great. I love the physical/digital combination of Filament. 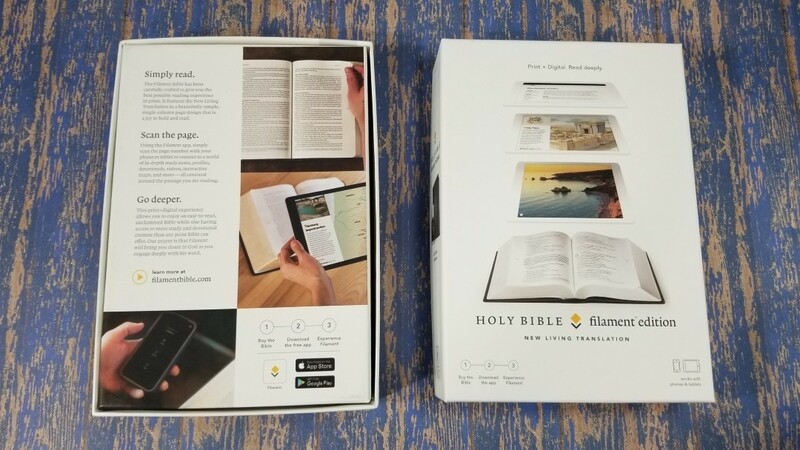 It makes sense to produce a physical Bible that focuses on the text that’s great for carry and reading, and then provide more in an app that could possibly fit in a Study Bible that’s available on the device that most of us have with us everywhere we go. I recommend Filament to any NLT reader. Most of the following are affiliate links. 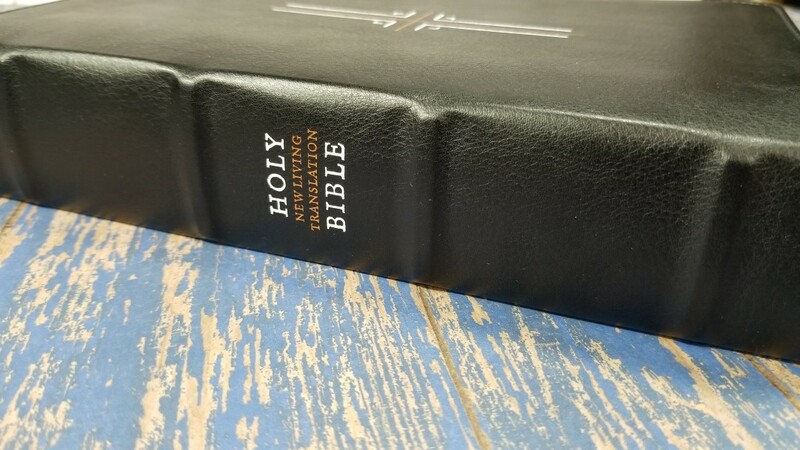 Tyndale House Publishers provided this Bible in exchange for an honest review. I was not required to give a positive review – only an honest review. My opinions are my own. That is a very interesting concept. Wonder how practical and helpful it actually is. Definately love the idea of being able to pull up videos and pictures relating to geography and such. Can’t say I am a fan of the NTL though. The concept is interesting though.